Ernest Taylor was born in June 1896 in Easthorpe, Bottesford. His parents were Smith Taylor and Hannah Taylor nee Asher. Smith Taylor was born in Rowston, Lincolnshire in 1850. Hannah Taylor was born in Bottesford in 1844. Esther (8), George W Taylor (7), John Taylor (5) and Florence (2). 1n 1911 Smith Taylor was still living at the Orston Lane Gate House with Ernest but Mrs Taylor had unfortunately died in 1904 and Florence was no longer at home. Ernest was still at school. In the 1911 Bottesford Scout Troop photograph Church Street he was on the back row. Before the 1st World War Ernest worked at The Vineries. 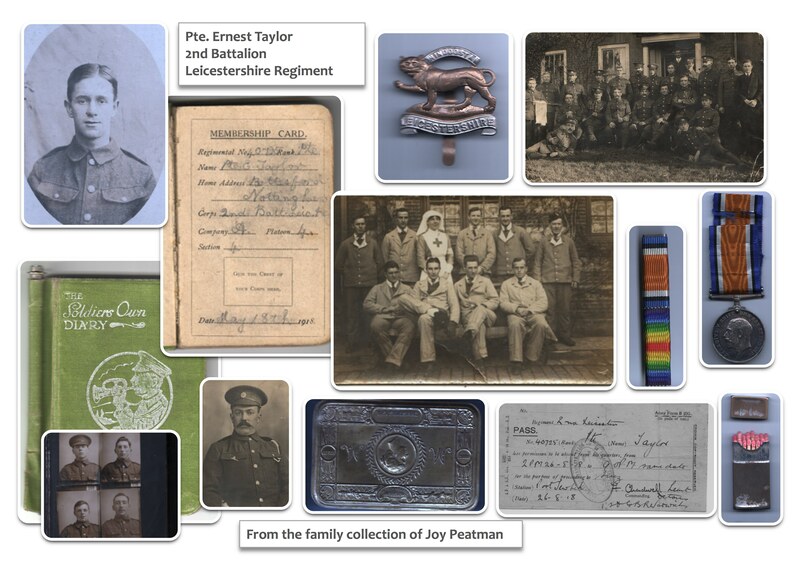 Joy Peatman has kindly made available a collection of her grandfather’s war time memorabilia. This includes a diary for 1918. There are details of his war service for that year in the middle east in that diary. He was in the armed services from 10th October 1914 until 26th February 1919. He received the Victory Medal and the British Medal. 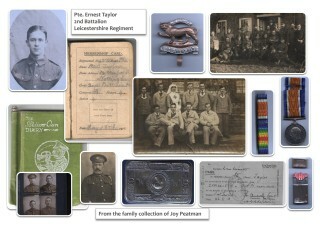 Erenst Taylor was a member of the British Legion in Bottesford. He had 3 children George, Alwyn and Owen Taylor. He always worked on the canal. The family lived at Easthorpe and then moved down to Bottesford to live in Standley’s cottages. Margaret Taylor (no relation) remembers that Ernest used to write with a thick black pen, his writing was instantly recognisable.